This letter was written by William Henry Quaintance (1841-1923) of Chester County, Pennsylvania. William’s pension record states that he served in the 104th Pennsylvania Infantry and later in Durell’s Company, Independent Battery D, Pennsylvania Volunteers. A regimental history of Durell’s Battery indicates that William joined the company in January 1864 as a corporal. William wrote the letter from a camp near the Weldon Railroad south of Petersburg, Virginia. Though not engaged, William describes the battle in which elements of the 5th Corps (Warren’s) captured and defended the Weldon Railroad on the 19th of August and more recent action by Hancock’s 2nd Corps near the Jerusalem Plank Road. According to William’s death certificate (DOD 27 March 1923), he was born on 4 April 1841 and was, by occupation, a shoemaker. 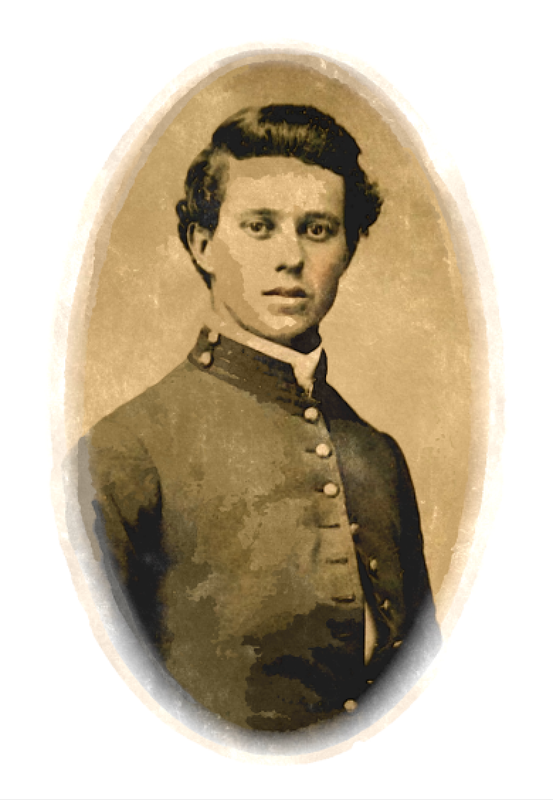 His father was Joel D. Quaintance (1810-1845) and his mother was Mary Eshelman (1819-1903). His immediate cause of death was cardiovascular-renal disease but he also suffered from “cerebral degeneration insanity” according to his wife, Lydia Anna (Swinehart) Quaintance (1859-1942), who served as the informant. He was buried in Cambridge, Pennsylvania. In the 1860 Census, 19 year-old William was enumerated in the household of Esther Layton (b. 1805) of Honey Brook (Coatesville Post Office), Chester County, Pennsylvania. Other members of the household included Esther’s children, Jesse (age 25), Augustus (age 23), and Mary (age 19) Layton. William wrote the letter to his sister, Mary Jane Quaintance (1843-1925) who married John Isaac Swineheart (b. 1822) in February 1869. I believe that John Swineheart was the father of William’s wife, Lydia Anna. 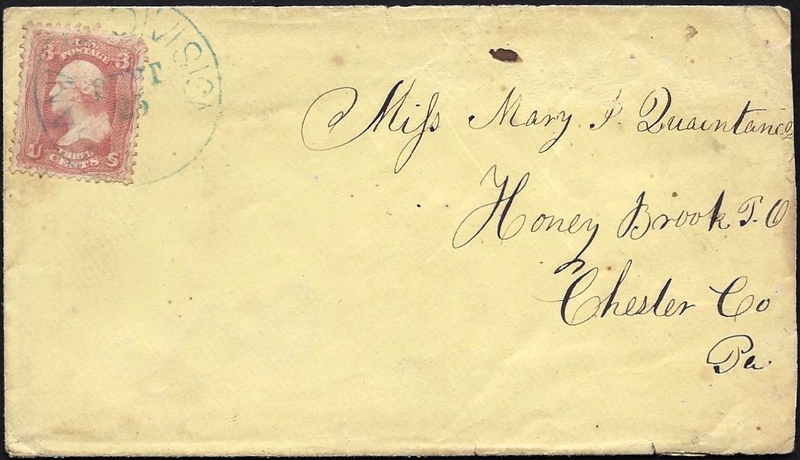 Addressed to Miss Mary J. Quaintance, Honey Brook P. O., Chester Co., Pa.
Camp near Weldon Railroad, Va. It is with much pleasure & satisfaction I take up my pen this morning for the purpose of writing you a few lines in answer to your very kind & most heartily welcomed letter which came duly to hand last evening. Dear sister, I was truly delighted to hear from you once more. Everything has been very quiet along our lines for several days past. There was a hard fight the other day between the Johneys & the 2nd & 5th Corps. The contest was severe but did not last long. We repulsed the enemy. The loss was heavy on both sides. Our forces now hold the Weldon Railroad & they are likely to hold it. General Sherman is cleaning the rebels right out at Atlanta. He showed the rebs a yankee trick the other day by taking the city & quite a number of prisoners, small arms, &c.
Things at Mobile are going on all right up to the latest accounts. I am in hopes the war will be over in less than a year from now at furthest — perhaps sooner if things go on in our favor as they have for the last month or so. Well, I must now direct my pen to some other subjects. In the first I will inform you that we are paid off on the 24th of last month but owing to a mistake which was made in the payrolls, I did not get any bounty this payday. Therefore, on the account of this, I can’t send you the sum that I intended to for by this I did not get half as much as I expected to. But I have given Joseph H. Ney twenty dollars to bring home for you. The reason why I did not send it by Express was because there is a good deal of risk to run & Mr. Ney is coming home the 24th of this month so I thought I could could just as well send it with him. He gave me his note for the above-named sum. I will send the note in this letter. It will be due on the fifteenth of next month & by your presenting it, you can get the money. You had best present it as soon as it is due. I expect we will get paid before long again. When I do, I shall have all that I can spare. You had better put a revenue stamp on this note for without a revenue stamp, the note is good for nothing in law. Well, I guess this is explanation enough. If not, why lust let me know in your next letter what part you do not comprehend. You spoke in your letter of things being high in price. I will give you a quotation of our market here. Butter 75 cents per lb. Cheese 50 cts. & eggs 75 cts per doz. Common brown sugar 35 cts per pound, flour 20 cts per lb. apples six small ones for 25 cts., peaches four for 25 cts. Watermelons from $1.00 to $2.50 cts each. Ham 50 cts. per lb. Dried beef 50 cts per lb. This is the price of things in this country & Uncle Sam has been half starving us for the last few weeks so we had to buy things at these prices to keep us in motion. I think if we gain a few more victories, things will come down a peg or two.